Here's the recipe (care of my good friend, Jenn) for the Pumpkin Bar treat I had at Thanksgiving Point the other day. 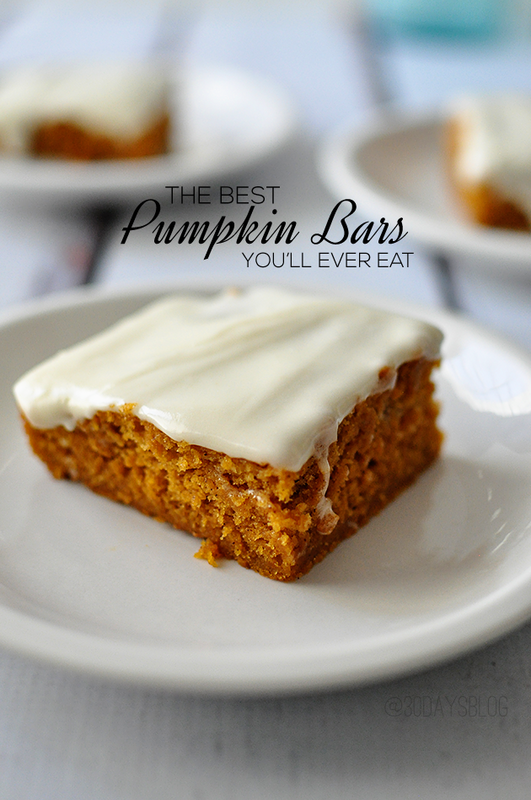 They really are the best pumpkin bars you'll ever eat, and should be part of your family's autumn traditions. Welcome fall-- we've been waiting for you! These are a snap to frost if they are frozen before hand. My favorite fall treat! Yum. YUM! I am so excited about the fall weather (even in Bakersfield) and can't wait to make these yummy treats! Okay you were probably making reference to this kind of pumpkin bar. Slow, but I got it! In your previous post I had left a comment wondering about the "Pumpkin Bar" I was thinking like a buffet/bar and wondering what in the world? How much pupmkin can their be? You meant a singular tray of pumpkin bars. Probably like this recipe. Thanks for sharing. Thanks for exposing my lameness. Oh, that sounds good! I have been in the mood for pumpkin with the change to fall weather. I'll see if I have enough pumpkin to make these today. Yummy,it makes me anxious to start off the Fall season when I have a two week of a Fall Break.. then I will have tons of Fall spirits. I am anxious make it after we get back from the Pumpkin Patch this Saturday! This recipe sounds yum. Nothing beats your mom's pumpkin cookies though. I wonder if I will get Matt to make them this year? I can't wait to see everyone at the wedding. Our whole house is in high anticipation.